The Houston Polo Club is proud to offer several leagues to accommodate the many skill levels of our playing members. Polo School is an eight week long instructional course in the sport of polo. Individuals who have never played will learn everything necessary about the game, while enthusiasts of all levels can sharpen their skills. No previous riding experience is required. There are polo school sessions for both children and adults. Students are only required to bring a helmet and boots. HPC provides instructors, horses, tack and mallets. Margarita League is a beginner polo league. This league meets twice a week during the polo season. Polo instructors play on each team to offer coaching and assistance. Horses are available for lease for this program. The 2 Goal League is a step up from the Margarita League. Here players (patrons) compete with polo pros on each team to help move the ball and increase the level of play. 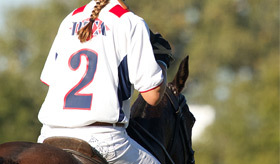 These players compete throughout the polo season and take part in bi-monthly tournaments. Club league is an intermediate league that requires players (patrons) to hire one professional polo player, own 4 horses, includes 4 chukker games, 2 week tournaments, opportunity to learn from higher rated players to help prep for better/ faster polo. Play with a different pair (patron and pro) every tournament. Patron player owns 4 to 5 horses, hires one professional polo player, fun competitive polo, USPA level tournaments, 2 patrons per team, opportunity to learn how to 3rd man games and improve game strategy. Requires player (patron) to own 6-8 horses, hire professional polo players. League is fun, competitive fast polo, USPA level tournaments, 1-2 patrons per team. Opportunity to improve playing ability by playing with high rated professionals players. Requires own 6-8 horses, patron hires 3 professional polo players, opportunity to play Sunday’s at HPC, fun competitive fast polo, with high rated professional polo players, USPA level polo, USPA umpires.